It is a long day… we leave home at 10 am for National Airport and arrive in Milan 16 hours later (at 8 am Milan time) but, all in all, the trip is fine. The long layover in NY (4 hours) turns out to be a positive since the plane from DC is delayed so we have time for a sit down lunch and a couple of hours in the very comfortable waiting area near our gate. Plane is pretty comfortable (in economy plus seats) and it was on time into rainy Milan. Our luggage arrives and we meet our driver who takes us to our "apartment" in the center of Milan. The room is quite spacious with a small kitchen, a couch and table, a wall of windows overlooking the Corso Vittorio Emanuele II, a busy pedestrian street with lots of shopping, bars and restaurants. We can even see the back of the Duomo from our small balcony. The weather leaves something to be desired--soft rain and overcast--but the forecast promises improvement. 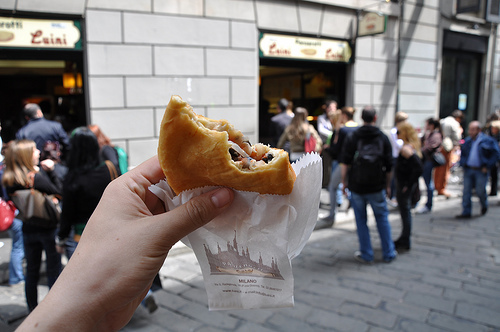 We go out for a walk in the mid-afternoon and stop for panzerotti (a folded over filled fried pizza) at Luini, a local favorite. When I had walked past it closer to the lunch hour, there were two lines 60 deep snaking out into the street but by the time we arrive, it is much shorter. We eat our panzerotti in a nearby piazza with a number of other Luini patrons. After a stroll past the Duomo, we head back to the apartment where we both crash for a couple of hours. One of the disadvantages of arriving so early in the day without enough sleep is that it is hard to make it through without napping. We are lucky that the apartment was vacant and we could get in immediately. I go out and scout for a place to have dinner…. we don't want anything elaborate... and we end up at Papa Francesco's--right around the corner from where we ate our lunch. It is another pretty Italian trattoria and the staff is very friendly. At 7:30, the only customers are tourists… predominantly Asian..but we are happy to eat early and simply. Diana has a tasty risotto with asparagus and I have spaghetti alle vongole which is not the best I have ever had. We drink a half bottle of Umbrian white wine and are on our way. The line for gelato at the shop we stop at is too long, so we just walk back to the apartment and watch an episode of MI-5 (hooking computer up to the television) before falling into a deep sleep. Tomorrow we have reservations for Leonardo's Last Supper and, if the weather cooperates, will go to the roof of the Duomo.